Tomorrow the real adventure begins. If I can get down Gammon Lake and through the little Upper Gammon Lake there is a creek that heads north. The creek I am interested in branches off of the little jungle river that is used to travel to Indian House Lake from Upper Gammon Lake. It is the creek less, if ever traveled. If it can be used it will allow access to Joey Lake which is unnamed on the park map but is the second lake east of Lightning Lake on the east end of Royd Creek Claire has informed me that there are some trappers trails that will allow me to get to Royd Creek and some old portages I explored on an earlier trip. When I passed the creek on a May trip there was a lot of water coming down it but that was during an extremely wet period. Monday morning, anxious to get down Gammon Lake, the canoe was packed at first light and breakfast again postponed until the big water was behind me. 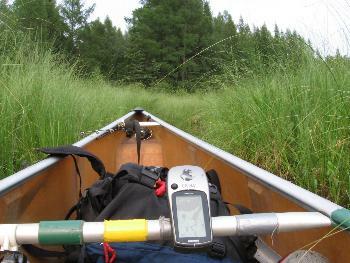 Blueberries on the portage provided enough energy to paddle down choppy Gammon Lake. With the big waters of the lake behind me and energy waning a stop was made for breakfast. 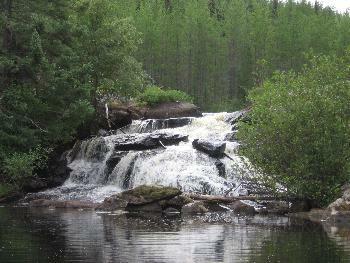 Powered by the cereal and pepped up with the coffee the travel to the river entering Upper Gammon Lake went swiftly. A good flow of water in this river was encouraging. My progress really slowed when I entered the small stream that heads toward Indian House Lake. It was narrow and the over hanging Alder made it a chore to make any progress at all. It took me an hour and a half to get to the branch in the creek that goes to Indian House. Unfortunately there was no current at all in the channel I wanted to use. Hoping that the water was sneaking by in another place or that beavers had big dams upstream impeding the water I paddled into the stagnant and narrow channel. In a short distance the corners were too tight to work around so I did what I should have done earlier. I got out of the canoe and pulled it along while walking in the streambed. Soon the channel deepened and the Alder brush no longer grew along the banks. The reprieve did not last for long and to add to the problems the stream bottom got too mucky to walk in. This forced me to pull with a strap from atop the marshy banks. A check on the GPS of my progress was not good news. In one hour I had moved 400 meters up the 3100 meters to Joey Lake. Of course I had traveled a lot further than that but in the winding stream it only moved me that 400 meters closer to my goal. A quick math exercise told me that if I could keep up the pace I would get to Joey by dark. In another hour of slogging I came up on a small beaver dam that raised the stream level a foot. Soon after I came up on a wall that stopped my progress. Standing up in my canoe revealed the wall was an active beaver dam holding back over a meter of water and soon after there was another big dam holding back another meter of water. Now I was really making headway. When I came to a rock outcrop I celebrated by fixing lunch. Another check of the GPS showed that only 900 meters remained. Adding to the good news was that in 700 meters it would be possible to portage 200 meters into a bay of Joey Lake. 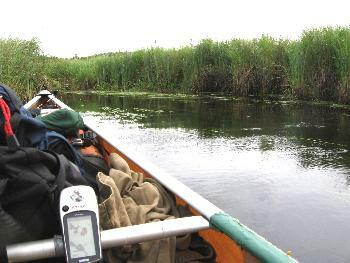 Right after lunch conditions went sour fast and I was again reduced to pulling he canoe from the channel. 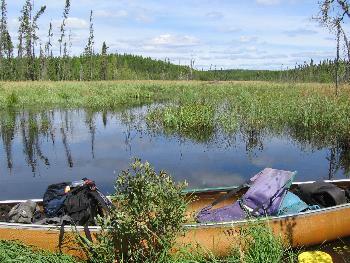 When logs started blocking my way I was close enough to make the overland portage to Joey Lake. At 4:30 I was paddling on Joey Lake. It had taken four and a half hours to travel to Joey from the fork in the creek and about 7 hours from Upper Gammon Lake. If those big marsh spanning beaver dams had not been there I probably would have been forced to camp on the rock outcrop where I had my lunch. Was it worth it? I will think so tomorrow when I get to explore this new country. Right now, I’m tired!! After a long nights sleep, unzipping the tent revealed that the rain clouds were still here. 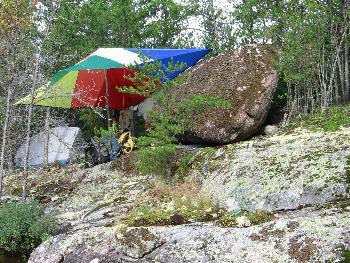 It had started to rain when I landed the canoe to set up camp yesterday. Nothing serious, just passing windless showers. 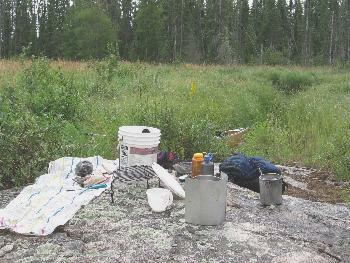 Eventually water was put on to boil and breakfast started. The cereal needs to simmer 15 minutes so during that time I decided to see if there really were Walleye in Joey Lake as I had been told. Tossing the pink dardevel into the slightly choppy water produced a 17-inch walleye before the cereal was done. The water is dark and so are the Walleye. The northwestern shore has some exposed rock but the rest of the lake has sparse Jack Pine down to the waters edge with Spruce in the lower bays. A trip around the corner near my camp to check out the trail out of here showed it to be too wet to use. Another route was trimmed up that starts on the original trail on the other lake but veers to higher ground along the north side of the marshy area connecting the two lakes. Portaging the canoe to the next lake and paddling across to the portage, I found it to be an easy 70-meter carry over a good rock portage. A Cairn marks each end of the portage. With the exploration taken care of it will be an easy matter to move through the two portages and set up camp on Lightning while the next two portages are figured out. That will probably be after a final breakfast of hash browns and Walleye on Joey. The day has turned into a gorgeous one. Blue sky, puffy Cumulus clouds and a light breeze from the north. My plans for the afternoon include letting my Walleye digest as I sit back with a mug of coffee and enjoy the lake from the shade under my tarp. During this break a Ruby-throated Hummingbird came in to investigate my tarp. Its behavior was puzzling but before the coffee was gone the explanation came to me. This year I am using a multi colored tarp of bright colors. Today it is set up using a center pole so all the side panels angle down. To the hummingbird it must have looked like the biggest feeder or flower it had ever seen. It just could not figure out where the nectar was. Before supper I went to explore the end of the stream that I could not get to yesterday. I found that I could travel down the backed up waters to a big beaver dam at a rapids 250 meters upstream from where I had portaged across. After a lot of hiking the area it seemed that the portage across was the best option. I found an old trail with brush closing in on its sides that gave great access almost all the way to Joey Lake. The trees and brush get thicker near Joey but you can see the water and work down to the shore. On the way back to camp I did some jigging with the pink lure and got a 24-inch Walleye for a real feast. A lot of Walleye for one man but after yesterdays slogging I am going to indulge.